The New Year is indeed the time for new beginnings. It is also the best time to reflect on the year that was and look forward to the year ahead. Make this momentous occasion a memorable one by celebrating it along the White Beach of the beautiful Boracay Island. Choose to celebrate in no less than the best Boracay New Year’s Eve party venue, Discovery Shores. At 7PM on 31 December 2016, savor a delicious New Year’s Eve banquet featuring international cuisine and homegrown favorites by the award-winning Culinary Team of Discovery Shores Boracay. Delight in sumptuous dishes such as Lechon de Cebu, Brick Oven Roasted Rib Eye, Honey Baked Ham, the Discovery Filipino Rotisserie and appetizing desserts like the Panna Cotta, Donut Farm, Chocolate Fountain and other traditional Filipino delicacies. Guests will likewise enjoy the live dinner entertainment by the Smooth Band. The New Year’s countdown party starts at 11PM at the beachfront with beats by DJ Ron Poe, John “DJ Knoxville” Monreal, Leonard Regis on the sax and the international duo WeRWolvz. The best fireworks show only happens at Discovery Shores Boracay so it’s definitely a must-see. Rate is PHP 5,888++ per person inclusive of the New Year’s Eve Gala dinner, live entertainment and access to the best Boracay New Year’s Eve countdown party venue. To check out complete event details, please go to http://www.discoveryshoresboracay.com/boracay-new-years-eve-party. 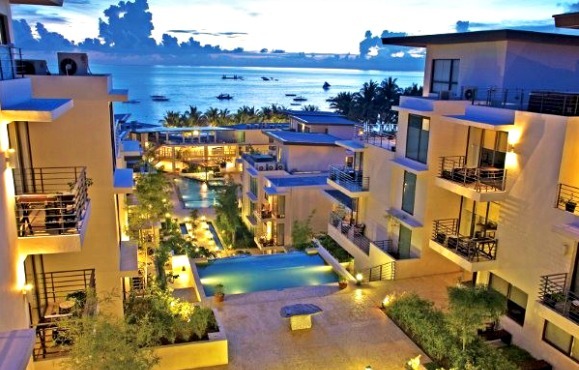 Discovery Shores Boracay is an award-winning 87-suite luxury resort in Station 1 of Boracay’s famous White Beach. The beachfront property features the highly-acclaimed Terra Wellness Spa and well-loved restaurants Sands and Indigo. The resort is consistently listed in Travel + Leisure Magazine’s World’s Best Hotels and is a constant awardee on TripAdvisor. Get updates through Discovery Shores Boracay’s official website at http://discoveryshoresboracay.com.